Providing trustworthy and helpful information about finance and investing to ordinary people everywhere. 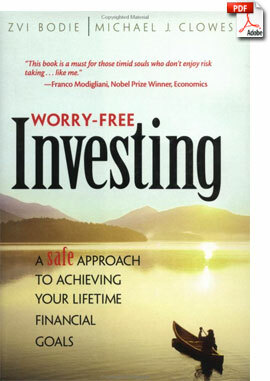 To purchase a copy of “Worry Free Investing” in PDF format, click on the PayPal button below. You will be redirected to the PayPal website to make your secure $5 payment and download the book. A PayPal account is not required for this transaction. IMPORTANT: After completing the PayPal transaction, you will need to click on the “Return to Merchant’s Website” button on the PayPal confirmation page in order to download the Worry Free Investing PDF.